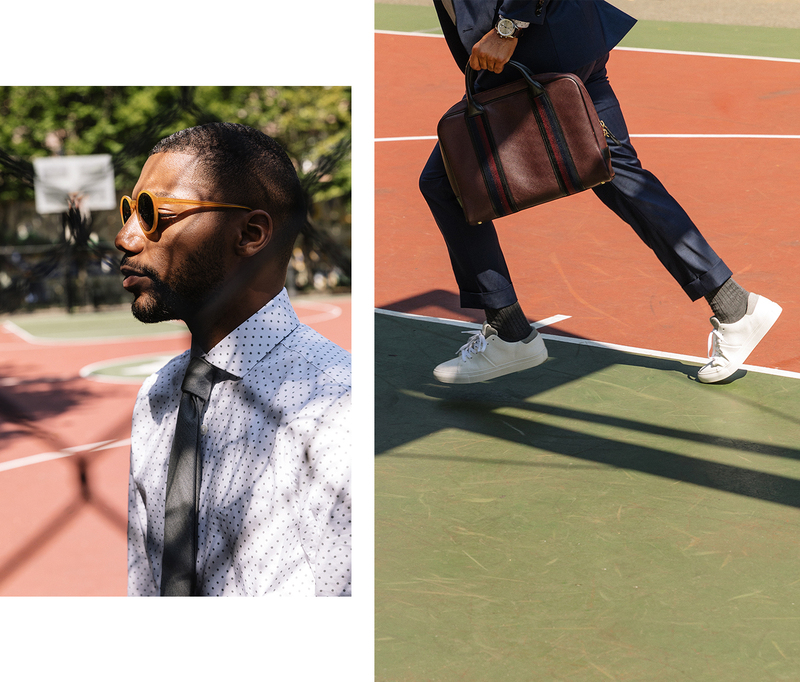 Brandon Bryant isn’t your run-of-the-mill menswear influencer. He does wear clothes exceedingly well, on top of regularly sharing grooming, fitness, travel, and tech tips with his legion of loyal followers. But in many ways, Bryant’s personal brand is just his day job. 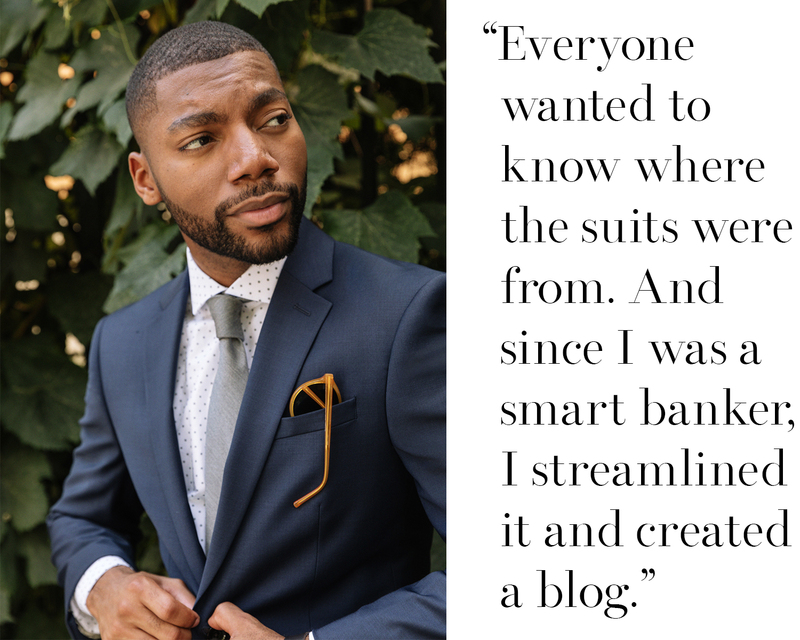 It’s his other job—running Harlem Capital, an investment fund that focuses on funding people of color and women-owned startups—that makes his daily social media grind worth it all. Bryant began his career in finance, moving from Ohio where he grew up and went to college, to New York City with big goals and a serious interest in economics. He soon found another passion at a tailor’s shop in Brooklyn. At work, Bryant stood out in high-waisted trousers and peak-lapel jackets. His one-of-a-kind kits, in colors like teal and burgundy, were a far cry from all the pleated pants, gingham shirts, and fleece vests his co-workers wore. Soon people were asking him where he got his clothes on a daily basis. Not one to keep a good rec to himself, Bryant started introducing co-workers and friends to his trusty tailor. Then he had an idea. 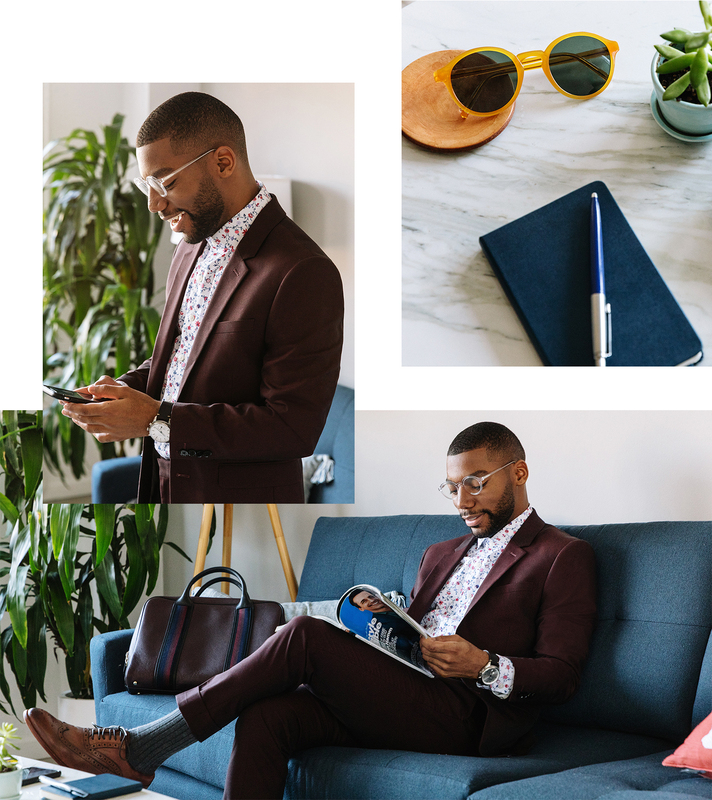 More than a year after starting his website, Bryant quit his job in banking and took one at a small boutique advertising agency, where he absorbed everything he could about social media and how to build a brand. Eventually, he went out on his own full time and hired an agent. Now his resume includes TV commercials, voice-over work, print, social media, podcasting, and a whole lot of enviable and luxurious travel experiences archived in photos of himself grinning ear to ear on a beach, in the desert, or strolling into one of many fashion weeks worldwide. 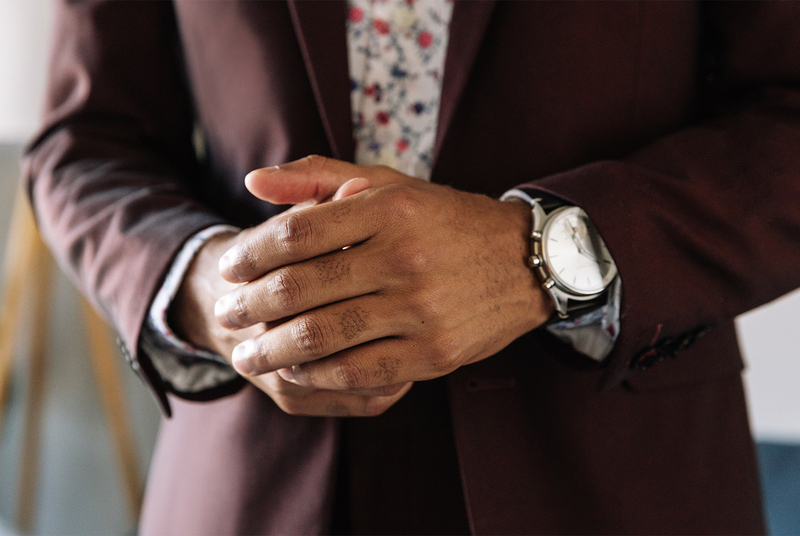 Meanwhile, his fund Harlem Capital began out of a frustration he had in the finance world, namely those who get financed often looked a lot like the white men doing the financing. So he and three friends got together to force a change. Their mission is to invest in 1,000 diverse business founders over the next 20 years, and they’re well on their way. 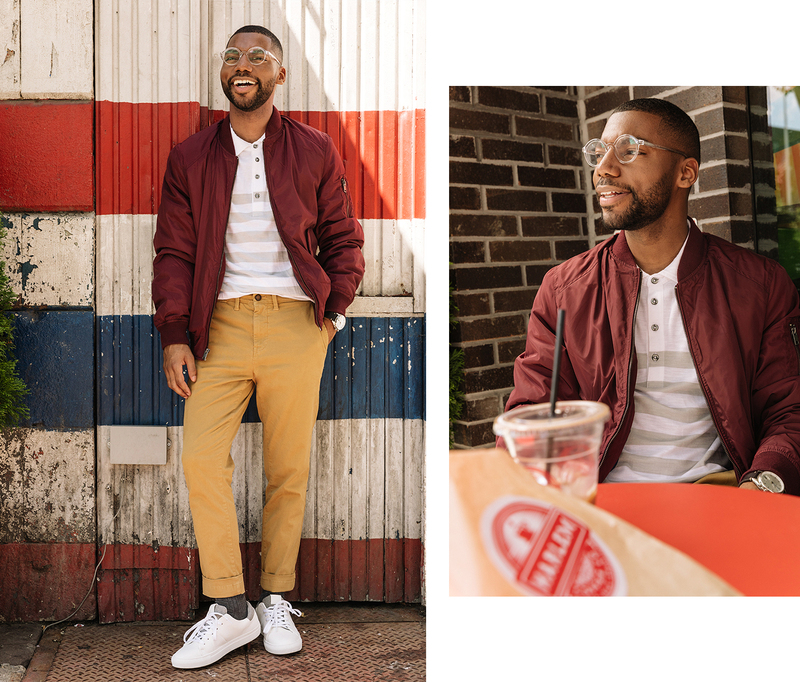 We caught up with Bryant in Harlem to check out his favorite food, talk about clothes, and get a few recommendations for fall dressing. What are some new things you’ve been trying out with your wardrobe lately? I’m kind of making everything minimal. I wear a lot of green, brown, blue, and gray tones. I try to stay in that realm, but I do love pops of color. My first custom suit was burgundy and pretty out of the ordinary with a double-breasted jacket. That suit crushed it for me, and I wore it without a tie. I don’t like wearing ties. But I do like wearing my shirts buttoned all the way up. When you were still working in finance did everyone have a positive reaction to your style or were there people who didn’t get it? Yeah, people who didn’t take their job that seriously were totally down for it. Anyone who took their jobs too seriously was just like, “You’re paying more attention to your clothes than your job.” And I just thought, yeah, because clothing is going to be my job. I knew it was going to be my gateway. Clothing was going to be my foot in the door. But banking people take offense to personal style sometimes. It’s a finance thing. You can’t even come in wearing pinstripes until you’re at the manager level. There are these unspoken rules, like you can’t do this until you get to that level. But even at that level, you’re calling attention to yourself, and that may not go well for you when you’re getting your bonus or when you go in for your review. It’s a barrier to entry, basically. Banking is just like don’t try to be different. Get your job done and go home. If you do that, you’ll be so successful as a banker. So it was definitely not for you? For the non-influencers out there, how hard is it to make a living in social media? Was it difficult to break in? In the beginning, I worked with my agent on a non-exclusive level because she hadn’t worked with a lot of men. But we’ve made a lot of strides with companies I had no idea existed but that wanted people who look like me to help promote their product. Now you’re taking what you make as an influencer and investing that money back into diverse startup founders? Yeah, of the eight startups that we have invested in so far, it’s been all of our own capital. The money that I make in social media, I am investing into startups. But we’re actually fundraising for the fund now. We are raising twenty-five million dollars so that we don’t have to put up all of our own money. That’s how a real fund runs, you put up 1 to 2 percent as a general partner. And then you kind of just make it happen. Can you talk a little bit about how your style has changed since you broke out of banking? Once I got out of banking, I actually stopped wearing full suits. I started wearing amazing jackets with crazy peak lapels with jeans. Then eventually as I started doing more startup entrepreneurial work, I went the [tech start-up] way where I’m always a version of the same thing: a gray sweater or tee with some type of high-waisted suit pant that I had made. Then I was like, maybe I should stop wearing dress shoes because I am walking everywhere. So I swapped them for white sneakers. That’s my thing now: gray top trousers and some type of sneakers. Tell me about your glasses. So the glasses—these are my old man glasses—but they’re clear so that makes them modern. I like to take old things and make them modern. In my opinion, accessories should create a sense of style that is unique to you. They can be from any brand, but they still look like you. 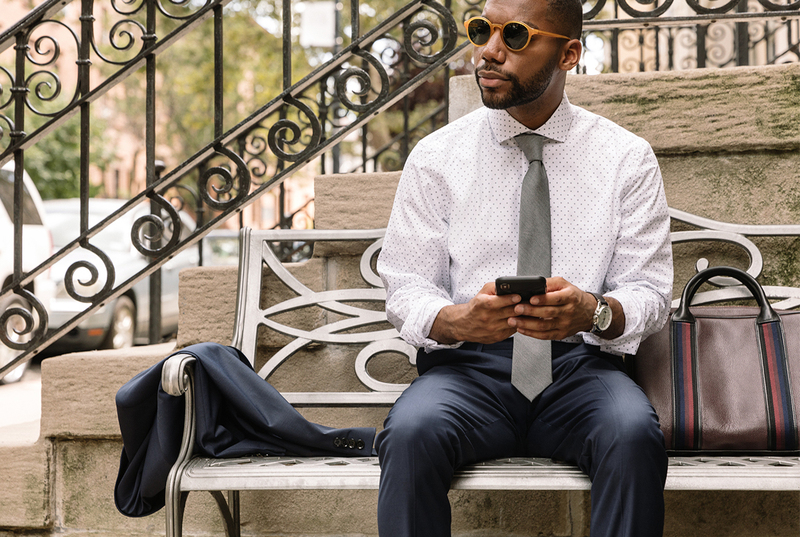 Business attire aside, how would you dress for a first date? For a first date, it would still be the same. I would probably put on some of my favorite cologne. I would definitely wear a plain shirt and I would wear shoes that actually pop. When you’re meeting with clients these days for Harlem Capital, how do they react to your clothing? Every day, people stop me, like on a plane someone said, “I meant to tell you when we were boarding that I liked your pants.” That’s dope. My main goal is to be the best-dressed person in the room without having to wear a suit. So as long as I’m accomplishing that every day, I’m good.